Ukrainians remember all those who sacrificed their lives for their motherland. 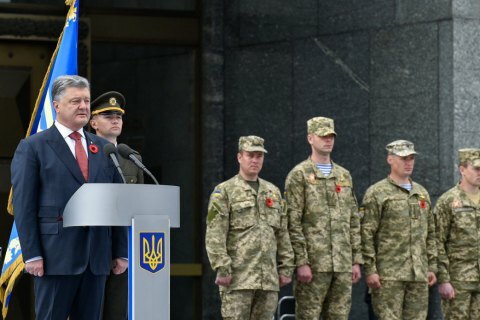 Ukraine's contribution to the victory of Nazism was enormous as many battles took place on its territory and millions of Ukrainians and other nations fought the enemy side by side, President Petro Poroshenko has said. He was speaking at a solemn gathering outside the National Museum of History of Ukraine in World War II on 9 May marked as Day of Victory in post-Soviet republics. "Of course, the war had a global nature. Of course, nations of the former Soviet Union fought together. However, the war also had its separate, Ukrainian dimension, which is certainly the most important to us, Ukrainians," he said. He said that Ukrainians would continue to celebrate this day but not the way Moscow does it. "It cannot be described by two colours only, black and white, and it seems that there are no more colours in Soviet and Russian palette," the president said. Ukraine strongly rejects Moscow’s attempts to use victory over Nazism in World War II for its "revanchist, imperial and expansionist" needs, he added. "The Second World War ended 72 years ago and the Kremlin is still eager to command Ukraine like four Ukrainian frontlines of the 1940s. Today, in Moscow, during the 'Immortal regiment' procession, they promised to carry portraits of Russian militants sent to Donbas to kill Ukrainians; those who came with the sword to us and that is why they died by the sword. This is a true symbol of the so-called friendship, friendship in big and wicked quotes," he noted. Poroshenko described the "Immortal Regiment" campaign a sophisticated model of political speculations on people's feelings. "Moscow came up with it not to honour memory of the defenders, but for the Russian expansion to the neighboring countries to be assisted by not only those alive," he regretted. According to Poroshenko, aware of their traditions and history, Ukrainians remembers all who sacrificed their lives for the motherland. "We will definitely win. This is our sacred duty to the fallen in World War II and to the heroes who sacrificed their lives for a free Ukraine these days. This a duty to our children. This is a duty to all future generations," he pledged.